Learning to budget is scary. After all, it means you have to say NO to unnecessary purchases and keep your eye on long-term goals at the expense of short-term pleasure. There are a variety of ways to budget, ranging from the restrictive and somewhat impractical “envelope system” to the more vague and potentially ineffective “wing it” system. I’d like to present a balanced approach to budgeting that is practical, simple, and shouldn’t take any more than a few minutes to implement and monitor. This step is critical, because without it, you really have no idea how much you should be saving and spending. As discussed in “How To Earn Your Freedom,” the time it takes to reach financial independence is almost exclusively a function of your savings rate. Starting from a net worth of zero, if you save 50% of your income (take-home pay), you will reach financial independence in approximately 15 years (nice!). Conversely, if you save 10% of your income, you will reach financial independence in around 50 years (brutal). The choice is yours, but if freedom from paid work is important to you, you’ll probably want to earn your freedom as soon as possible, so that’s generally why I recommend a savings rate near 50%. In any case, figure out how intense you want to be, and that’s your target savings rate. Once you know your target savings rate, you can calculate your yearly spending goal. That leaves $40,000 per year as your yearly spending goal. Alternatively, you can look at your take-home pay in your paycheck and calculate your monthly spending goal (and then yearly spending goal) based on this. However, if you have a portion of your paycheck going towards your 401k, this may complicate the calculation. In any case, don’t get too bogged down in trying to figure out the exact number. The point is that your yearly spending goal is MUCH LESS than your actual take home pay. If you spend everything you earn, you will never earn your freedom. At this point, you’re making progress on your budget. You have a yearly spending goal consistent with your income and your long term desire for financial independence. This is the most basic way to look at a budget. Don’t spend any more than $40,000 per year, and you’ll do just fine. Pretty simple, right? It turns out that it’s challenging to adhere to a yearly spending goal. You’ll need a bit more structure to make sure your hundreds of purchases throughout the year don’t quietly annihilate your spending goal. You’ll also want to eliminate all debt and keep your fixed expenses as low as possible to maintain some buffer in the budget. In “The Big 3,” we learned that housing, food, and transportation account for the majority of an average household’s budget. So keep these as low as possible. Purchase or rent a modest house, buy an affordable car with cash, and make your own meals. I’ve listed other fixed expenses below. Shop around for your insurance, install double pane energy efficient windows in your home, buy a fuel efficient vehicle, set up a garage gym, and find a $5 barber. The lower your fixed expenses, the more room for your variable expenses. While you’re keeping fixed expenses as low as possible and minimizing frivolous variable expenses, you’ll need to understand the differences between needs and wants. Having a safe place to live with running water and door locks is a need. A 3,000 sq foot mansion is a want. Having healthy food to eat at every meal is a need. Eating out for lunch each day is a want. Having some sort of cell phone is probably a need in today’s world. Having the absolute latest iPhone is a want. You get the picture. Be very frank about your needs and your wants. This will help prevent a budget explosion. Once your have minimized your fixed expenses, add them up. If they exceed your budget, then you need to go back to the drawing board and reduce your fixed expenses further. You could also increase your income or reduce the aggressiveness of your savings. Just keep in mind that if you reduce your savings rate, you prolong your journey to freedom. If your fixed expenses are below your yearly spending budget (as they should be), then the amount left over will be used for your variable expenses, such as eating out and vacations. Divide this amount by 12 to get your discretionary spending per month, which you can allocate to various categories, such as eating out and vacations. 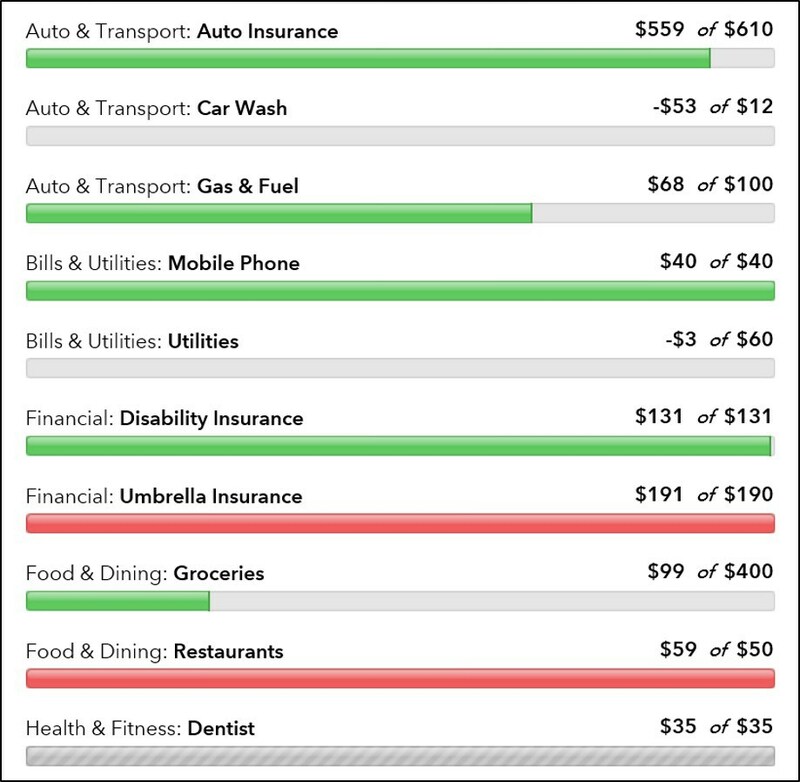 Mint has a feature where you can create monthly budgets for various categories. I recommend that you use a credit card (or debit card) for most purchases and monitor your spending using either Mint or Personal Capital. The first time you use these programs, you will need to categorize your expenses manually. After doing this, the program will “learn” the categories for most merchants, and you will only need to devote a few minutes per week to make sure all new purchases are categorized appropriately. 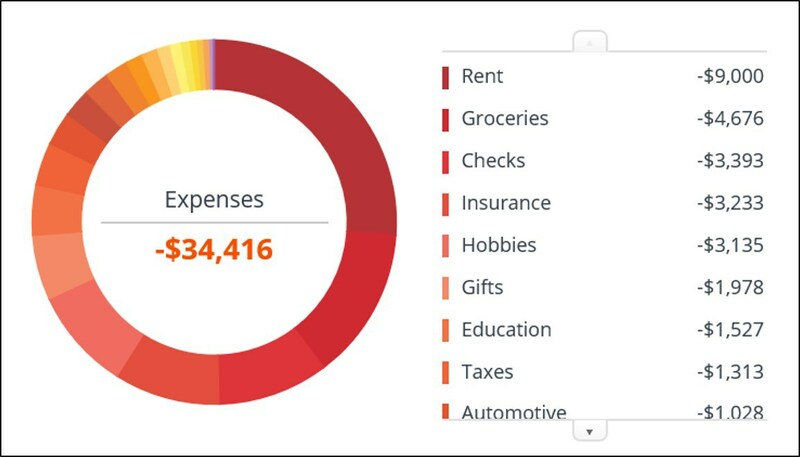 At the end of the year, you can see your total spending as well as a breakdown of your spending by category. It is often very instructive and revealing to see how much your weekly restaurant dates add up to at the end of the year! As you monitor your spending, you may find that that you are able to reduce costs in some categories while other categories are impossible to reduce any further. Feel free to modify your budget as needed. The only thing that stays more or less constant is your yearly spending goal. If your income increases, you can either increase your yearly spending goal, or increase your savings rate, which will reduce your time to financial freedom! There are many ways to budget. If you have no budget, you will be unlikely to ever reach your goals. If your budget is too onerous or impractical, you won’t stick with it. I believe the approach illustrated here offers a good balance between having no plan and having a plan so full of nuance and rigidity that it becomes unworkable. Let me know what you think. How do you budget? What works for you and what doesn’t? < Previous post Doctoring or parenting? It shouldn’t be a choice.